Fake pet shipping company using a name similar to a legitmate company. WE WISH TO INFORM YOU THAT, WE ARE DONE WITH THE REGISTRATION OF YOUR MALE RUSSIAN BLUE KITTEN . SO, ATTACH TO THIS EMAIL IS THE TRANSFER OF OWNERSHIP DOCUMENT YOU NEED TO SCAN AND SIGN IT THEN EMAIL TO US THE SCAN COPY WITH YOUR SIGNATURE ON IT SO THAT WE CAN PROCEED WITH THE DELIVERY TO YOUR HOME ADDRESS TODAY. THIS DOCUMENT IS TO TESTIFY THAT YOU ARE NOW THE NEW OWNER OF THIS KITTEN. Animal Abandonment: Anyone who abandons an animal is subject to a $600.000.00 fine and/or up to Ten months in jail. (EUROPE,USA AND ASIA Penal Code Sec. 597S). The Leash Law: It is not permissible to let your pet run at large day or night, with or without a license(County Code Title 10, Section 10.32.010). Yearly Licensing Requirements: State law and county ordinances require that a pet license be purchased every year and be securely fastened to the pet ’s collar. Licenses are required at four months of age or older, even for pets that never leave a house or yard. Failure to license your pet-may result in citations, a court appearance and fines (EUROPE,USA AND ASIAA). Health and Safety Code Sec. 1920, EUROPE,USA AND ASIA. Food and Agriculture Code Sec. 30502 and County code Sec. 10.20.190). pets license are also required in all county unincorporated areas and several contract cities. Providing Adequate Food And Water: All pet owners are required by law to provide their animals with adequate food and water. Failure to comply with this humane pet care measure is a violation of EUROPE,USA AND ASIA Penal Code Sec. 597E and County Code Title 10, Sec. 10.40.010. Vaccination Requirements: Rabies vaccinations are required for all pet 4 months of age or older. Failure to comply may result in a citation and a court appearance. Vaccinations must be valid for the entire licensing period. EUROPE,USA AND ASIA. Health and Safety Code, Sec. 1920 and County Code Title 10, Sec. 10.20.220). 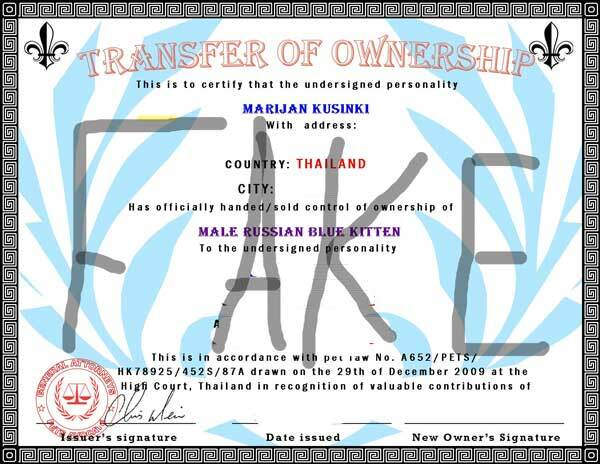 This complaint was laid by the PET SHIPPING Agency regarding the abandonment of your kitten registered to them by Mrs Marijan Kusinki which by laws, the transfer of ownership papers are now on your name and it shows that you are the new owner of the kitten . So by abandoning them you are thereby violating the rules of the International Pet Organization and if you do not comply with an estimated period of 48 hours, legal actions will be taken. Our team of lawyers are already in place to see that this matter is handle with urgency and legality. So for abandoning your pet under our care and not making sure that the safe delivery of your pet is successfully reached, we have taken this matter to the court and the team of lawyer's of the company have already process all paper works and you are here by fine to court with the sum of $600.000.00 to be paid for pet abandonment. Failure to comply to this rules, you will be taking to court and be jailed for abandoning your pet under the company's cares for unnecessary reasons. This documents has been approved, legalized, signed, sealed, endorsed and authorized by the International Pet Association and should not be violated. We await your urgent reply to this email.